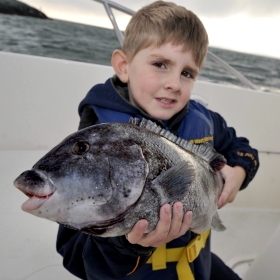 Tautog fishing tips are often in demand by anglers who fish along the Northeast coast since this species is known to be a particularly finicky feeder. “Tog” or blackfish, as they are often called, have a tendency to crush baits and spit them back out before the angler has a chance to get a solid hookset. Although, try fishing for tautog and you’re likely to find that the thrill of bringing one to the boat will have you hopping back aboard for an encore trip. If fishing with natural bait, such as green crabs, you can use a swivel to attach a few feet of 50-pound monofilament. Rig your sinker at the end of the monofilament using a surgeon’s loop knot, and then use a dropper loop about 7 to 8 inches above to attach a separate 2-foot strand of mono with a 4/0 hook.